The Google Pixel 2 and the Pixel 2 XL are the first phones that are equipped with an eSIM. The eSIM is the next step in the evolution of SIM cards and instead of using a physical SIM card, it lets you change your network provider using software. The technology isn't new - we've already seen Apple's version of it as well as other products such as Samsung's Gear S3 smartwatch use it but it is the first time it's been equipped on a phone. At the moment, the only provider that works with eSIM inside the Pixel 2 is Google's Project Fi, an MNVO (mobile virtual network operator) in the US running over the T-Mobile and Sprint networks. Over time, this should change as more network providers adopt the standard. No dual SIM for you! The Google Pixel 2 and Pixel 2 XL also have a tray that can accept your standard nano SIM card. This makes the Pixel 2 phones work with your current provider. 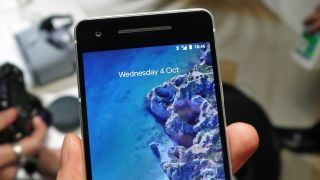 Unfortunately, Google has confirmed to TechRadar that you can't have the nano SIM and the eSIM working simultaneously on the new Google Pixel 2 handsets - at least not at this time. If both of these worked simultaneously, it would have allowed the end user to use the Google Pixel 2 as a dual SIM phone. Most of their well known phone manufacturers such as Samsung, LG, Huawei and Lenovo have offered this functionality on their phones for the last few years. We've reached out to Google to find out if this feature could be enabled through a software update or if would require a change on the hardware level and will update the story when we hear from them.